PWD Bamenda is back in the big time after 14 years. The Abakwa Boys will be playing top-flight football in the 2018-19 season after coming a long way since its relegation. P-Ton Ton beat AS Etoa-Meki in their last game to stay on top of the MTN Elite Two Championship and put an 8-point gap between themselves and third-place Tonnerre Kalara Club of Yaounde. With two days of play left, the Abakwa Boys are at the top with 51 points and are followed by Avion Academy FC and Tonnerre Kalara Club with 51 and 46 points, respectively. Mathematically, PWD Bamenda has booked their place already to play the country’s top-flight football next season for the first time in 14 years. The Abakwa Boys almost dropped out of the MTN Elite Two championship last year when they narrowly escaped relegation. Their promotion could have been robbed should they have been relegated in a case that could have seen them relegated. 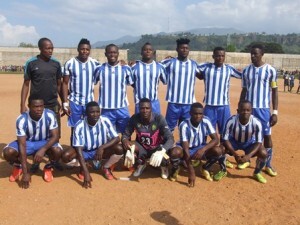 Fortunately for them, four elite teams from the Northwest had threatened to withdraw their participation in the Elite One and Two championships if an office decision relegates PWD of Bamenda to the regional league in place of Botafogo FC of Douala that won a controversial decision against Fovu Club of Baham. Thanks to the decision by the Court of Arbitration for Sports (CAS) in Lausanne, Switzerland, PWD Elite two status was maintained and Botafogo FC, DAC and PSG were relegated into the inferior league instead of PWD Bamenda, following a decision of the Chambers of Conciliation and Arbitration of the National Olympic Committee of Cameroon. The President of PWD Bamenda, Pascal Abunde, in an interview granted Lions4life in August 2016, promised to keep to his words by taking the club to Elite One football in three years. Hear Him: “When I came in as the team President, I pledged that I was going to take the team to Elite One football and this I will do. This is my second year at the helm of the team that was already out of the picture for 11 years. It has been a learning process and, believe me, the team will play in Elite One at the end of the 2017/2018 sports season.” This, he finally did. Created some 66 years ago, PWD Bamenda has played many seasons in the first division league and the last time they did so was in 2005. The club is one of the oldest in the country. Since its creation, PWD has had remarkable performances at the Cup of Cameroon where they have lost two finals; 1967, against Canon of Yaounde and, 1979 against Dynamo of Douala. However, in the championship, they have failed to shine. The club has never achieved any significant performance except in the 2003 season where they ended the Elite One league at the 3rd position. PWD was relegated from MTN Elite 2 championship in May 2008, alongside Kumba Lakers, Victoria United, to the then Provincial Division 2 League. Meanwhile, at the continental level, the club has made only one campaign which was during the 2004 CAF Confederation Cup, following its third place in the league at the end of the 2003 season. They eliminated TP Mazembe from the Democratic Republic of Congo in the first round, but were booted out in the round of 16 by AS Douanes of Senegal (2-2, 0-3). PWD Bamenda was a breeding ground for players like Dr. Ekwe, Peter Essoka, Frankline Ngoh, Zachary Nkwo, Sunday Nji, Augustine Simo, Ben Bola Forcha, Matthew Andongcho Mbuta, among others.